In the Western World, "Hotel Restaurants" are exceptions to the "gourmet lists" of good restaurants. Of course you will find some of them in cities like Paris, London, Munich, Madrid, Lisbon, New York, San Francisco, but is not the norm – to find the top restaurants in hotels in one city. In Asia, and especially in China, due to the problem of the language, way of life, locations, etc., it is often difficult to find the right "gourmet" restaurant in the cities you visit, unless you have a local friend who will guide you to the best restaurants in that city. Hong Kong's name is derived from "Heung Kong" – meaning "Fragrant Harbour" – the Chinese name for an anchorage at "Aberdeen" (after Lord Aberdeen), so named because ships would take on fresh water from a spring nearby. Kowloon's name – meaning "Nine Dragons" – is derived from an incident 800-years ago when boy Emperor Ping counted 8 hills and remarked there must be 8 dragons because of the ancient belief that a dragon inhabits every mountain. Ping’s prime minister told him there were aactually 9 dragons ("Kow-loon") as another ancient belief held that emperors were dragons. Today, Hong Kong perches on the edge of mainland China occupying an anomalous position as a territory straddling two worlds. Since the handover from Great Britian in 1997, Hong Kong has become a "Special Administrative Region of China" and is no longer a subject of colonial sovereignty. Past and present fuse here to create a capitalist Utopia embedded within the world’s largest "non-capitalist" country. Hong Kong consists of four sections: Kowloon, Hong Kong Island, the New Territories, and the Outlying Islands. Kowloon and the New Territories form part of the Chinese mainland to the north of Victoria Harbour. Hong Kong Island, containing the central business hub, lies on the southern side of the harbour facing Kowloon. The Outlying Islands are comprised of a composite of 234 islands. Hong Kong offers a dense concentration of shops and shopping malls with a cross-pollinated cosmopolitan culture that embraces Chinese and British cuisines with equal enthusiasm. It is the perfect gateway for travelers to Southeast Asia and China, providing a smooth transition from West to East. As one of the key economies of the Pacific Rim, Hong Kong Island showcases a gleaming landscape of skyscrapers and boasts a highly developed transport infrastructure that makes commuting around it a dream. But, "Yes, Hong Kong is in China!" The city has traveled a long way full and seen big changes since my first trip to Hong Kong in 1969. In that time, there were few tourists and many "expats." Hong Kong was an English colony then, where the "In" restaurants were of the Western type. Some of those restaurants still exist today, but serve more as "nostalgia" for the old times than as something worthy of the Gourmet Corner. Cucina, featuring Asian and Western show kitchens influenced by Italian and Chinese flavors, offers an unparalleled dining experience in a stylish setting that overlooks stunning harbor views. With a cozy terrace for ‘al fresco’ dining, as well as a hip and a happening bar, for after-dinner cocktails, Cucina also offers customized menus for private functions and special parties. * Indulge yourself in the most extraordinary culinary experience. * Watch the chefs cook up a drama over every Chinese, Asian or International dish. * Hear the intensity of the sizzling. * Feel the passion and creativity we put into every dish. * Lose yourself in a menu of hundreds of vintage wines and exotic cocktails. * Succumb to the temptation of desserts. * Smell the richness of every recipe emanating from each cooking station. * Taste the freshness bursting out of every ingredient. # Honey Pudding - Chilled red "Dragon fruit"
That’s all – enjoy your food & "Bon Apetit!" With more than 115 hotels of international standards, the choice of accommodation is difficult. But since "space" is a main factor in Hong Kong, of course I will recommend the place where the rooms are very spacious in comparison to the normal standard in the other hotels. Only reserve a room with "Hong Kong Harbour View" – with great views of Hong Kong Island & the Ocean Terminal where all the "Big Liners" arrive. The other rooms in the hotel are of no interest – spacious, but without views. Prices start at 2,600 HK$ and can be negotiated by your Travel Agency, or via IAPA (International Airline Passengers Association), or any International Travel Web you will trust or direct by the Hotel Website. My recommendation goes for a room at "The Continental Club" on the 17th & 18th floors – of course, a room with "Hong Kong Harbour View!" — Complimentary American Buffet Breakfast (06:30 AM– 11:00 AM) with "Butler Service". — Complimentary use of "Broadband" access for 1 hour daily in "The Continental Club Business Centre"
— Library featuring a wide selection of international newspapers, magazines, travel guides reference books. Now you know how to make the right choice for your hotel. Amidst the hustle and bustle and the neon of Tsim Sha Tsui is an eating oasis offering a memorable dining experience. It is called Knutsford Terrace and is located right behind the Miramar Hotel on Nathan Road. This collection of eateries has transformed the area into a culinary Nirvana offering food lovers more great dining options amidst the Culinary Capital of Hong Kong. It's a smorgasbord of taste treats that is sure to delight. Befitting this international eating oasis, this district is packed with "Gourmets" keen to sample the culinary delights that Hong Kong can offer. Whampoa Gourmet Place in Hung Hom boasts many specialty restaurants under one roof featuring Northern and Southern Chinese food. There is a bewildering choice of Asian gourmet dishes ranging from tempting snacks to full meals. For a truly unique Hong Kong experience, there is no better place to visit than Dried Seafood Street (Des Voeux Road West) and Herbal Medicine Street (Ko Shing Street) in Sheung Wan. Here, in the Western District, unique aromas and fragrances will assail your senses as you walk from shop to shop gazing at an unbelievable array of dried seafood products and Chinese medicinal herbs. Dried seafood, traditional medicinal herbs and tonics are extremely important to the people of Southern China. This is where health-conscious Chinese shop for local fish delicacies and ingredients for "rejuvenating tonics." Dried seafood has been an important local product for centuries. Wholesalers, located along Des Voeux Road West, offer many varieties of dried and salted fish, but also other dried goods like fish maw, shellfish, squid, and abalone. Trade along Herbal Medicine Street (Ko Shing Street) dates back to the 1880s. Along the street, the fragrance of medicinal herbs fills the air. Ko Shing Street is the wholesale centre of herbal medicine. Along with wholesale and retail, export is also a major activity here. The medicinal herbs and tonic trades are collectively known as the Nam Pak Hong (north and south trades) because the goods are imported either from the far north of China, ginseng and deer horn, or bird's nests and sea cucumber from the south. After dinner, don't forget to take the "cheapest" excursions and one of the best sightseeing bargains in the world. Take the "Star Ferry" between Central & Kowloon, for only around "20p" of HK$ fare in the upper-deck of the ferry. Now with 12 ships, the colored fleet has been plying the harbour for more than half a century. Grab a seat either at the bow or the stern for the best views of the Hong Kong harbor. It runs from: 6:30 AM to 11:30.PM, every day of the year. The money you save on the taxi ride you can invest in a drink at the "Top of the View" Bars: at the Peninsula Hotel (the most snobbish), or the Sheraton Hotel (the most intimate), or the top of the Hankow Centre (the new "In" place) in Kowloon. The views are breathtaking. Discover what makes Hong Kong the Hollywood of the East at this tribute to the professionals who have contributed to the territory's hundred-year history of filmmaking. The location on the Tsim Sha Tsui promenade offers incredible panoramic views of the famed Victoria Harbour and the memorable Hong Kong skyline. It is also a good place to watch the spectacular Symphony of Lights – a nightly multimedia show with added pyrotechnics on special occasions. 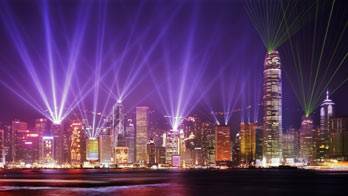 This spectacular multimedia display, named the "World’s Largest Permanent Light and Sound Show" by Guinness World Records, involves 33 key buildings on both sides of Victoria Harbour. The show creates an all-round vision of colored lights, laser beams and searchlights performing a stunning, unforgettable spectacle synchronized to music and narration that celebrates the energy, spirit, and diversity of Hong Kong. There are five main themes — Awakening, Energy, Heritage, Partnership and the finale, Celebration. On festival days, special pyrotechnic displays launched from the middle of the harbour add extra sparkle to the show. * Along the Avenue of the Stars on the Tsim Sha Tsui waterfront. * On the waterfront promenade outside the Golden Bauhinia Square in Wan Chai. The first W Hotel in China opened in Hong Kong in late October. Part of a 92-story waterfront skyscraper, the Cullinan Complex, the W Hong Kong (www.whotels.com/hongkong) features 393 rooms with high-tech amenities, a Bliss Spa, and a vertigo-inducing swimming pool on the 73rd floor with dazzling views of Victoria Harbour. 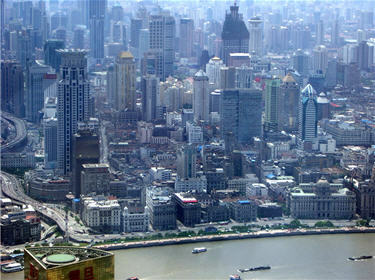 Shanghai ("The Paris of the Orient") is one of the most interesting cities in Asia and the world. It combines the old mystery of the Orient, with the "opium wars," the first foreign settlements in China, and one of the most progressive cities in our modern world. * Shanghai - "The Paris of Asia"
Shanghai has hundreds of hotels and restaurants, serving all tastes and pocketbooks for the international traveler. International chains such as the Ritz Carlton, Four Seasons, St Regis, Westin, Peninsula, Mandarin, Grand Hyatt, Hilton, and Sheraton, all have premises in the city. Some of them have "posh" restaurants and bars where all the trendy people meet. It opened in December 2005, and quickly created waves in local and international circles. "JADE on 36" is the "Best International Restaurant" in China! "A meal that changes the way you think about food." "A setting that changes the way you think about design." "A view that changes the way you thing about Shanghai." Jade on 36 will take guests on a "Cuisine de Voyage" where food is much more than just sustenance! It is an unforgettable "culinary adventure on a plate," a journey, one that seduces the taste buds and often surprises. You find yourself in a different place with every bite! In terms of ethnic influence, the tastes come from around the world. In terms of ingredients, it ranges from "truffles and foie gras," to "tinned sardines and Nutella." Not using ingredients in the traditional way is a hallmark of Jade on 36 cuisine. We are convinced that the "tomato & mozzarella" is, indeed a delectable dessert, and that the "ketchup sorbet" – served iced-cold – is actually a very nice accompaniment to the giant "French fry." A "lemon tart" that appears as a whole lemon, is remarkably taken apart and recreated so that the entire lemon is edible – the skin is actually a comfit – and the taste is unmistakably that of a fresh-baked lemon tart. I recommend that guests sample the tasting menus, which feature carefully structured, balanced samplings of the restaurant’s offerings. As you can see, the dishes and the menus are "far away" from what you expect to find on a "Classical International Hotel Restaurant." After your dinner, for a drink, don’t forget to stop next door at the most glamorous, chic, friendly, relaxing, and best "Bar with a View" in Shanghai; "JADE on 36 Bar". Located since August 1998 in the heart of Pudong, the financial centre of Shanghai, at the edge of the "Huangpu River" – The Pudong Shangri-La is the only hotel located directly opposite the historical "Bund." The Pudong Shangri-La enjoys a prime location with fabulous views of the best of Shanghai. The "Pudong Shangri-la" hotel has 28 floors in "Tower One" and 36 floors in "Tower Two," with the "Business Horizon Club" on the top floors. Remember, for the price, you have the best view of Shanghai, and if you can’t sleep at night, you can always count the ships going up and down the Huangpu River. The Hotel is only 35 minutes from "Shanghai Hongqiao Airport" and 50 minutes from "Pudong International Airport." For any information, price query, or reservations, or if you are not happy with the reservations made by your "travel agent,"
Shanghai (on the boundaries of the city) it has only: "Three Bridges" very far apart, and "Four Tunnels" – The main tunnel, on the city center being "Yan An Donglu Tunnel." In conclusion; "traffic jams" all the times! Regarding these "traffic jams," let me recommend that when you arrive or depart from Shanghai (Hong Qiao or Pudong Airports), that you take a "Limousine Service" at the airport or ask your hotel for a "pick-up" or transfer. The ride with a taxi will be around (350 or 450 Yuan), so very little savings, with the inconvenience that the "taxi meter" never stops even if you get stuck in a traffic jam, , and 98% of the drivers speak, poor or No English at all. With the limousine service, (in case of a problem) you can connect with the hotel or your airline (they all have mobile phones) and you have always the warranty of the service and the "Fixed Price," "traffic jam" or not. 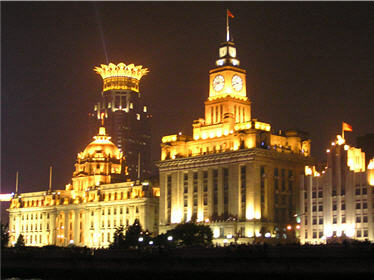 After this advice, let me to recommend the first thing to do in Shanghai is to go to see the "River" with "The Bund", the site of the old western settlements, have a stroll on the promenade, and if you are an early raiser, you can see all the locals doing their gymnastics (6:00 AM to 8:00 AM) before a day’s work. If you feel like it, you can join them. The last place on earth you want to spend a weekend, but it is worth the visit! First of all, to arrive in Ürümqi is not easy, as there are no direct flights from Hong Kong. The only possibility is to fly via Chengdu or via Beijing by Air China, [the best choice] among other Chinese Airlines. The flight is long, a minimum of 9 hours due to the transfers and frequent weather conditions, fog, wind storms, etc. Ürümqi has won a place in the Guinness Book of Records as the most remote city from any sea in the world at a distance of approximately 1,400 miles (2500 km) from the nearest coastline (Ürümqi being the city closest to the Eurasian Pole of Inaccessibility). In Ürümqi a continental steppe climate, where hot and dry summers prevail with average temperatures in July at 24°C (75°F) as well as damp and cold winters with average temperatures in January at 16°C (3°F). The yearly precipitation is about 273 mm. Ürümqi is the capital of the Xinjiang Uyghur Autonomous Region (1,66 million Km², 18 million people) in the Northwest of China. It is a land of 47 ethnic groups; Kazakhs, Mongols, Tadjiiks, Xibo, Hui, Kyrgyz, Han, etc. But the Uyghur ethnicity represents the majority of the regional population. Ürümqi, was the old capital of the North Silk Road, located in the middle of nowhere, surrounded by steppes and deserts, cold in winter, hot in summer. According to the 2000 census, Ürümqi has 2,081,834 inhabitants with a population density of 174.53 inhabitants/km². Very, very few people speak English! Ürümqi, meaning "beautiful pasture" in the Mongolian language of the Junggar tribe. * The International Grand Bazaar of Xinjiang is an Islamic bazaar located on Jiefang Nan Road. It is one of the most attractive tour sites in Xinjiang and Urumqi. * Hong Shan, Hongshan or the Red Mountain (Hóng Shān) is an inner city mountain in Urumqi. The mountain, sometimes referred to as a hill for it is smaller size than a mountain in form, is the symbolic scenic spot of Urumqi. * Glacier No.1, origin of Urumqi River, is the largest glacier located near a city in China. * Shuimugou Hot Springs is located 5 km northeast of Urumqi. * Xinjiang Silk Road Museum is located right next to the Grand Bazaar at No.160 Shengli Road. Bus No.110 stops very close to it. It is located on the fifth and sixth floor of a very large European style building which houses a shopping complex as well. The admission charge is 30 Yuan per person. Most of the exhibits have English labels, as well and some of their guides speak some English. * Erdaoqiao Market, is a place you can see lots of local goods produced by the minorities. The booth owners are all dressed in Uighur costumes. Some times they do not sell anything to tourists, but just invite tourists to dance. The most famous landscape gem near Urumqi which is Heavenly Lake (also named Tianchi Lake). It is particularly refreshing to travelers arriving from Urumqi. A moraine lake hemmed in by majestic snow-crowned peaks west of Bogda Mountain, Tianchi is 3,400 meters (11,125 feet) long, 1,500 meters (4920 feet) wide, 1,980 meters (6494 feet) above sea level. The pristine scene is stunning. A one-day tour usually consists of a boat ride on the lake, or a ride or walk along the lakeshore. From the YIN DU Hotel, a car with a driver excursion to the lake it cost you around 2,200 Yuan for all the day trip. Turpan City lies in the Turpan Basin, with most elevations in basin below 500 meters (1,640 feet). Turpan is the city with the lowest elevation in China. The city, which is also known as Huo Zhou (a place as hot as fire), is the hottest place in China. The annual average temperature is 14 C (57.2 F). Calculations say there are 152 summer days on average, and 28 really broiling days with the temperature above 40 C (104 F). The Emin Minaret is the largest extant old tower in Xinjiang; it is the only Islamic tower among the hundred famous towers in China. From the YIN DU Hotel, a car with a driver excursion to Turpan City, with a visit to the places mentioned costing you around 2,900 Yuan for all the day trip. 332 rooms, six restaurants, exercise equipment, spa, sauna, massage, swimming pool, night club. * In September 2006, Yin Du Hotel was named one of the Best Hotels in China. * In March 2007, Yin Du Hotel was awarded Five Star Diamonds for the fifth year. Tantalizing selection of Cantonese cuisine, prepared by our leading Hong Kong chef. Savor the best in Shanghai cuisine matched to perfection and signature recipes. Exquisite Beijing cuisine Prepared by Master Chefs. Creative Xinjiang cuisine prepared by local chefs. But with a difference; beer, wine & liquors are served. ☼ Nang: Is Uygurs' food. Uygurs cannot miss eating a Nang any day. Nang comes in more than 10 varieties. Nang is roasted in a special oven which is made of mud and earth otherwise the process is similar to cooking pancakes. The ingredients include wheat flour, corn flour or sorghum flour, with such seasoning as sesame seeds, onions, eggs, vegetable oil, butter, milk, salt and sugar. The stuffing of the buns is a combination of chopped mutton, beef and sheep's-tail fat. Then add chopped onions, salt and cumin. Seal the stuffing in dough square, and put in an oven to roast for 10 - 20 minutes. The buns are thin-skinned, with tender meat stuffing and very delicious. ☼ Xinjiang Noodles (Lamian): Are hand-pulled noodles which are soft and even. They are dressed with fried mutton piece, onions, cooked tomatoes and chili peppers. ☼ Zhua Fan (Rice Eaten with Hands): Is cooked with ingredients from fresh mutton, carrot, vegetable oil and rice. Nowadays, of course people use chopsticks and spoons instead of fingers. Milk Tea, Yoghourt Made of Mare's Milk, Rice-Filled Sausages, and Stewed Mutton Eaten by Hands, …etc. On my last 5 days of my visit, I ate at thist restaurant every day! A railway line connects the city to Kashgar (southwest). Ürümqi is also on the Beijing-Almaty (Kazakhstan) railway line via Dostyk, Kazakhstan. In 2008, there was a proposal to build a more direct line to Almaty. Ürümqi is located along the China National Highway 312 and China National Highway 314. Ürümqi is the farthest place on earth – but it is worth the visit! Remember – very few people speak English! Freddy Santamaria "The Smooth Operator"